Charitable organizations prefer receiving monetary contributions, but are often approached by people offering to contribute their time or render a service. Charitize wants to facilitate this exchange of skills for money, within a digital platform. Delivered end-to-end web-based platform, that connects service-seekers with service-providers, channelling the payment on service rendered, to a charitable cause or organization of choice. I was in an individual contributor role as a product designer on a team of 13 other product designers. I owned the filtering experience for service-providers and service-seekers. 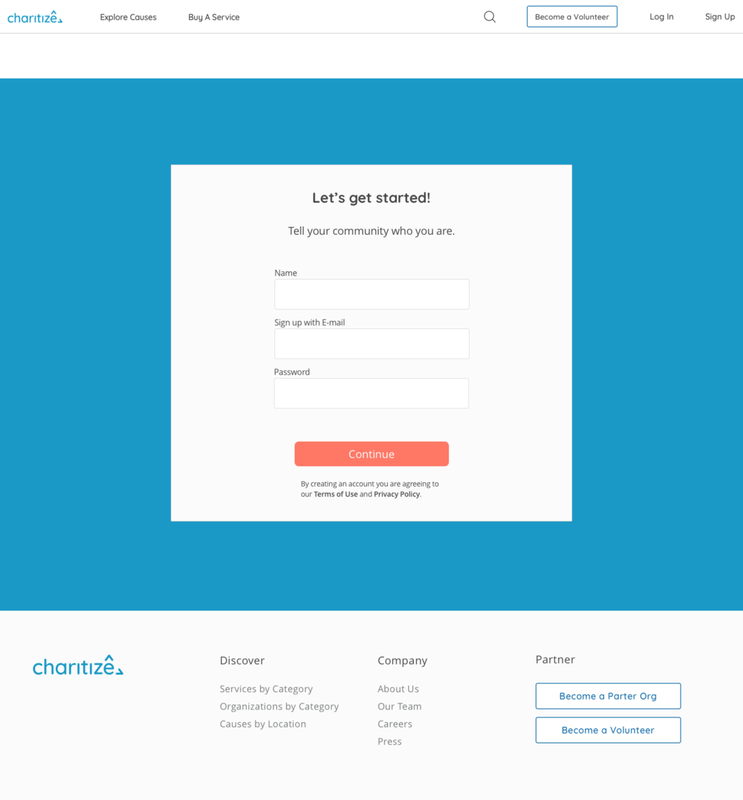 Charitize wanted a self-service platform that brings together three groups of people: service-seekers, service-providers and charitable organizations who are raising money for a specific cause. They had completed a proof-of-concept on a smaller scale involving 100 users across the 3 groups. We conducted user interviews with 20 people. Insights were grouped into motivations, behaviors, goals, channels and pain points to inform the best course of action. Each of us became experts in 2 or more of the solutions currently out there, so we would be able to draw on that knowledge, dos and donts when recommending solutions and features. We determined the user journeys and associated task flows as a team, and determined the experiences that would be similar and different across the 3 groups of users. That helped us in building the information architecture to work from. We split into 3 groups to tackle each user's task flow within the platform, keeping in mind their expected outcomes. We used design studio techniques like crazy 8s to generate as many solutions as possible for each part of the user journey. The platform and all key interactions were prototyped using Marvel. User stories generated early on as part of the customer journey process, were used in validation testing. Testing was carried out in two stages - lo-fi and hi-fi. The completed platform was delivered at the end to the clients. Here are some screens of the final product which I had a direct hand in designing in testing. 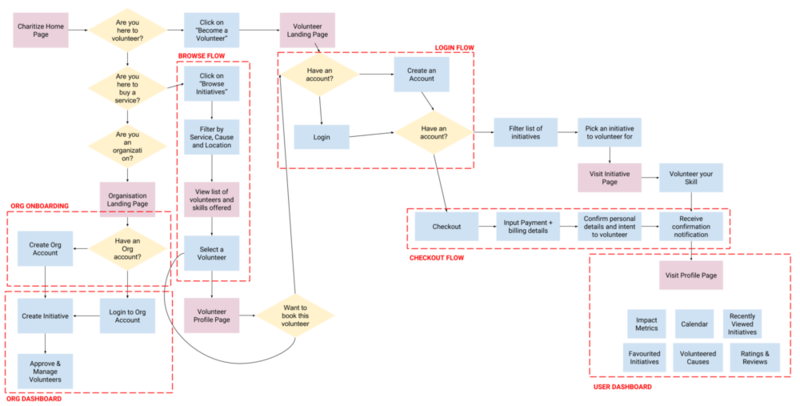 On-boarding flow for organizations and communities seeking contributions. Donors - refers to those looking to engage a service through a monetary contribution. Volunteers - refers to those able and willing to provide a service have payment for that service channelled towards a cause of their choice. Organizations - refers to communities, starting with places of worship and schools that want to raise money towards a specific cause. In the user research phase, we were interested in talking to those who had made a monetary or service contribution towards a charitable cause in the last 6 months. Our objective was to understand their intent for and frequency with which they render contributions, and their overall experience on the platforms they have used in the past. I created the below task flow diagram to help the product leads determine how the work could be divided up among the whole team. Visualizing the flow in the following way enabled us to take ownership of a series of interrelated interactions versus designing individual screens in silos. 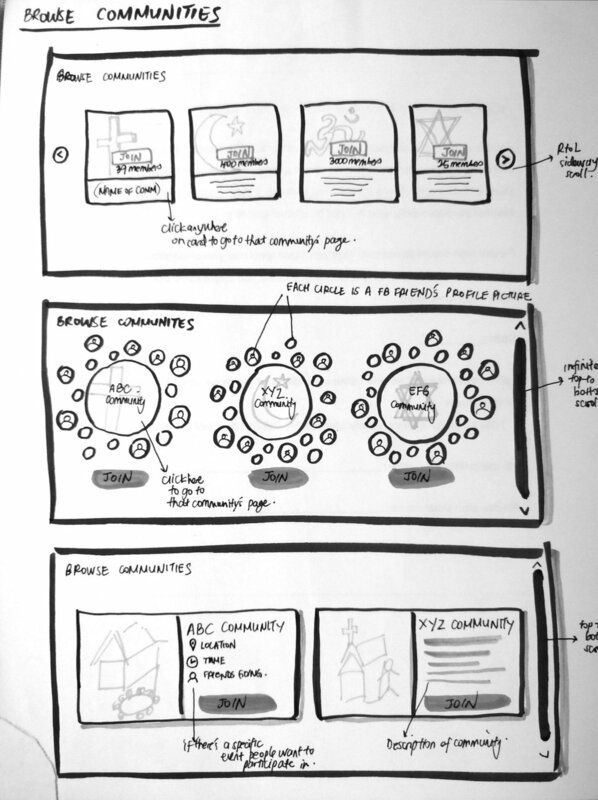 Fig 1: Sketches showing possible layouts of the initiatives when viewed by the users. Fig 2: Lo-fis of the filtering interaction. Fig 3: High fidelity designs with explanations on the design decisions that were made as a team. From the time we started working on the lo-fi, the onus was on each individual to test what they could and make incremental changes. We had a chance to put together a clickable prototype of the lo-fi for one round of validation, and a clickable version of the hi-fi for another round of usability testing with a different set of potential users. It was a great success as 4/5 users grasped the requirements of the tasks handed to them, and completed it easily during the testing of the hi-fi prototype. As a next step, Charitize will be working with engineers to implement this design. As a team, we were proud of what we could accomplish within a period of 6 weeks!